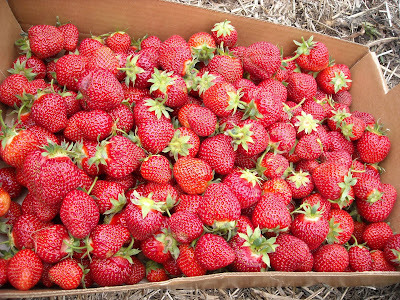 Went to the Jen Ehr Organic farm in Sun Prairie http://www.jenehrfamilyfarm.com/ to pick strawberries with the family today. 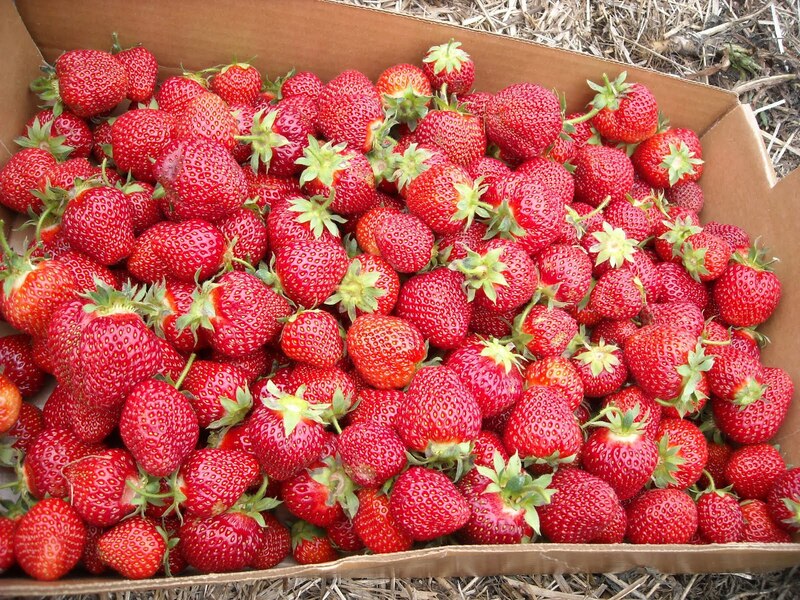 As part of our CSA, we were entitled to pick 10 lbs of strawberries free. We ended up picking 24 lbs of strawberries, but with Donna's plans to make jam, pies and a few other things, they won't last long. She's already finished making 10 jars of jam, so she's well on her way. So we're going into this farm and passing all kinds of "Subaru drivin', NPR supporters" as Michael Perry calls them and I start to wonder if maybe I fall under that category a little bit. While I don't drive a Subaru, I do listen to NPR on occasion, and if I'm not one of them, what am I doing on an organic farm, as a member of the CSA brotherhood? For the unenlightened among you, (like I was 6 mo. ago) a CSA is a deal where for a few hundred bucks, you get a box of veggies every week from the organic grower. The box changes as certain veggies come in and out of season. We haven't really received our first box yet, but I suspect my colon is in for a shock in the coming months. The reason I'm concerned and speculative about my status among the everyday man, is that yesterday I spent my afternoon setting up a rain barrel. This is so that we can catch rain from our garage roof and recycle it into our flowers, plants and herbs. It took no less than 3 trips to hardware and home improvement stores to get the diverter kit completed, but I ultimately made it work. The principle behind rain barrels is in urbanized areas, it keeps water from flowing into the storm drains and ultimately the waste treatment plant and on to the watershed. My garage is a bit of an exception to the rule because most of it drained just to my back yard. However, the water we do use for plants/etc. normally would have come from our shallow aquifer, and so I'm doing my part to some extent. We'll see how it goes. I suspect we'll find that it's either too much work and we'll end up draining it at the end of summer on to the lawn, or that it's the best thing we've thought of in a while and we put another one in hooked up to the house. I hope it turns out to be the latter, but as I said, time will tell. I suspect there's a windmill and worm farm in my future somewhere. So if I change to round framed glasses, start wearing my floppy fishing hat and sandals full-time, you have the right to remind me that I was raised in the city, and try as I might to run from it, it's part of my nature and best to try not to fight against it. Then maybe I'll come back to my senses, hire Chemlawn, start buying Tyson chicken-mill chicken again and start throwing my aluminum and glass containers in the trash, where they really belong. We've come a long way, baby. Now if we can just figure out this electric car thing.